Oscar Strauch was born in Germany in 1857. His father was killed in the Prussian war, so Oscar immigrated to this country seeking a better life for his family. He arrived in the United States alone at the age of 17, soon finding work in the rail yards. After saving for a few years, he sent for his mother and they moved into a home he had built in the South Scranton area. Along with his home, Oscar built a barn for his horses (there were no cars in those days). He began to rent out the services of his team of horses and carriages to carry area funeral mourners. Helping families during their time of need encouraged Oscar to start his own funeral service in the late 1800s. 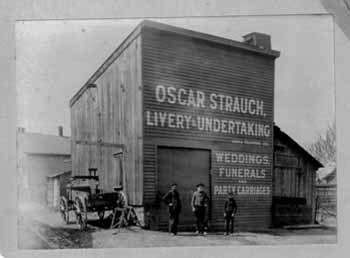 Upon Oscar’s unexpected death at age 59, the funeral home was handed down to his son, Emil Strauch. Emil continued to operate the business until 1948, when he died at the age of 61. Emil’s son, Arthur Strauch, continued in the family tradition. Arthur brought his son, Brian Strauch, into the family business in 1974. They worked hand in hand until Arthur died in 1992. Then in 1995, Brian Strauch and his wife, Debbie, expanded the business by building a new funeral home in the surrounding suburb of Scranton. In this age of large conglomerates and corporations, we are proud to still be owned by the same family for four generations. From these humble beginnings—and by always putting the families we serve first—we have been able to stay in business, and prosper, for over 100 years. The Strauch Family of Funeral Homes: from father to son, serving your family for four generations.